My friends at OxfordSM asked me to help them with a new launch recently, aimed at helping companies put customers at the heart of their communication. And as I worked on this article, I realised it touches on the issues many of my clients are grappling with, so I thought you’d find it interesting. Most organisations are investing time and money in trying to be more customer centric with their communication. But few feel they’re achieving it. That goes for all sectors, including consumer services, packaged goods, B2B, and government. We’re seeing that it’s hard to do well. To truly deliver customer centric communication means matching technical capability with your team’s skills. And you need to do it in a way that fits your culture and ways of learning. We’ve seen a range of strategies for success (and failure). Some companies focus on new technology to get new insights from their customer data. But, of course, to get the most from the technology you have to build and enable the skills of your marcoms, insights and analytics teams. Others have taken the view that it will help to consolidate their agency roster into a single agency team. The challenge here is how the marcoms team keep control, especially of their customer database and integrate the insights from third party analytics. Many concentrate on developing deep digital awareness and skills in their teams. But often their ways of working aren’t then integrated into the marcoms process, and they operate in a silo that’s separate from the rest of their marketing colleagues. To understand these barriers we surveyed around 80 organisations, with over £10 Bn of communication spend in 2018. 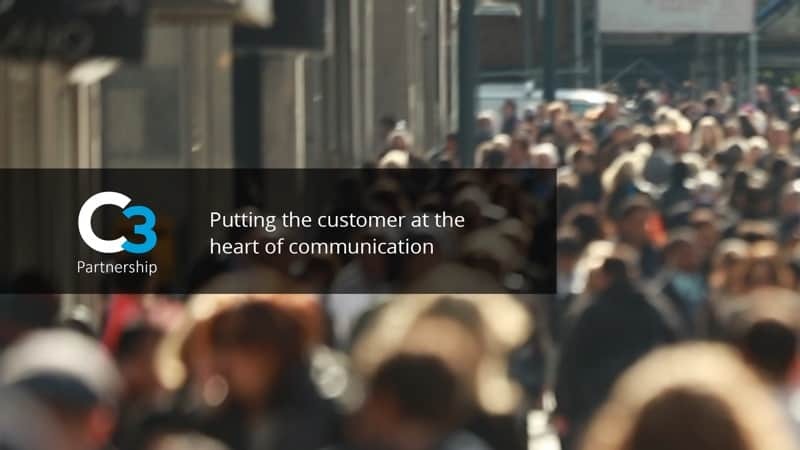 The results were clear – customer centric communication was the goal for almost every organisation. But only a third, felt there were delivering it, confirming our observation that this is a tough challenge. Organisations are struggling with data. For some it’s about not having a shared single view of customers. For others it’s not being able to generate actionable insight amongst marcoms and insight teams. A real surprise – only 13% believed that had easy access to the right sort of data in their organisation. The lack of marketing technology exacerbates the issue, and 70% believed that their technology wasn’t up to their challenge. Others lacked external agency support, with only 40% being satisfied with their current roster. Finally, most companies aren’t able to work effectively across organisational silos, to be truly customer centric. This is across functions, such as marketing, sales and insight. Or between global and local teams. That’s why we’ve teamed up with MediaSense under the C3 Partnership, to combine our experience in capability and media management for a more objective, holistic view. The first step is to understand how customer centric communication helps you build your brand, and to agree a clear goal. Then you need to think through all change levers, objectively, and create a roadmap for 6, 12, and 18 months. Our research report gives more detail on these issues, as well as our views on what it takes to succeed, and you can download it here.